Porosity is one trait of concrete that makes it stain so easily. No amount of scrubbing and stain removal product will get the stains out especially because it is buried deep into the pores of the slab. If any of your concrete surfaces have unpleasant stains and discoloration, there are more efficient methods of making it look good again aside from painting it. Paint is topical and stays on the surface so there is a possibility that it would peel, flake, or fade. Sometimes, all a concrete needs is a little boost. Ugly stains and discolored slabs? A way to disguise or, better yet, cover up would be great. Dull and boring? Polishing it would definitely bring out the best in concrete. Is the slab a little too porous? Then a good layer of sealer should protect it and make it last longer. No matter what the issue, refinishing it would surely be a decision you won’t regret. More often than not, resurfacing and refinishing are interchanged and sometimes considered as one and the same thing. However, they are not. Resurfacing involves changing the entire surface of a slab. This is an ideal fix for spaces with surface damage. The process involves the use of concrete coatings or overlays. Meanwhile, refinishing is maintaining the surface but topping it off with a new finish or replacing the old one. Concrete stains are popular refinishing products. 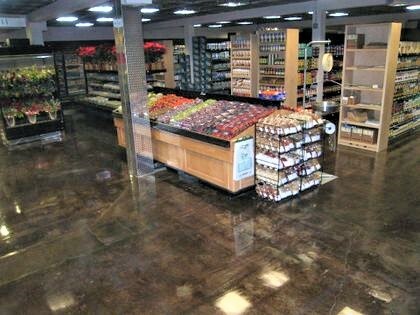 Sealers are also considered as outdoor and indoor concrete floor finishes since it enhances the look and shine of a concrete slab while serving as a protective layer as well. Polishing is also a type of refinishing solution. Concrete Staining – This is a popular method of coloring slabs. It comes in two forms: Acid and Water-based. Acid induces a chemical reaction that creates random, variegated effects similar to natural stone and leather. Water-based stains do not involve any chemical reaction so whatever color you apply will dry to that same color with a uniform tone all throughout. Colors can be mixed and matched for more decorative effects. Concrete Polishing – Waxing slabs is one great way to make it look utilitarian but luxurious at the same time. Keeping it looking waxed without maintenance is nothing short of the best thing to happen to concrete. This is ideal for indoor residential and commercial flooring. Concrete Resealing – Sealing a slab, be it new or resurfaced concrete, is highly recommended by contractors because it provides a protective layer that helps improve the slab’s lifespan. Often, concrete overlay sealing lasts for about a couple of years, depending on usage, and then it needs to be reapplied. Connect with expert concrete refinishing contractors in your area. Call (317) 854-4529 today. Finding a concrete refinishing company in Indianapolis, IN that is honest, reliable, and efficient is crucial to ensure a smooth, stress-free refinishing project. Indianapolis Concrete Artisans has all the right equipment and highly trained professionals to make your dreams a reality. We team up with our customers in improving and repairing concrete surfaces and giving them great pool decks, patios, driveways, interior floors, commercial flooring, and garage flooring ideas. Let’s get together. Call or email us and we’ll schedule you for a free consultation and quote.